Lt. General Bob Brown, Commanding General of I Corps and Joint Base Lewis-McChord, was a cadet member of the US Military Academy basketball team coached by Mike Krzyzewski (Legendary coach of the Duke Blue Devils to 4 NCAA Championships amd more victories than any college coach in history), while he coached at West Point prior to his hire by Duke University. 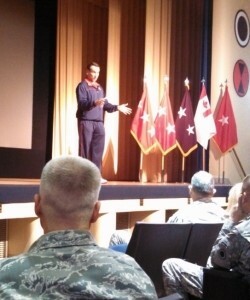 Lt. General Brown invited Coach K to come to Ft Lewis and speak to all of the officers and senior non-commissioned officers of I Corps and Ft Lewis. Members of the West Point Society of Puget Sound were also invited. Paul H. Roggenkamp, Founder and Principal of LEAD with COURAGE, was an enthusiastic attendee. Coach K’s presentation was entitled “Building a Team” based upon his experiences coaching the 2012 US Olympic Basketball Team to the championship and the winning of the Gold Medal. The team included such superstars as Kobe Bryant, LeBron James, Kevin Durant, Carmelo Anthony, Chris Paul, Russell Westbrook, James Harden, Kevin Love, Deron Williams, Andre Iguodala, Tyson Chandler, and Anthony Davis. Coach K referred to these players as “individual international corporations” because of their reputations, statures in the professional arena and world-wide recognition of their basketball talents. So how does a coach take such a group of individuals and mold them into a successful, undefeated team which wins the Olympic Gold Medal? In the coach’s own words, initially this group is merely a collection of individuals, which must be developed into a team. Rather than a political approach including diplomatic, sensitive, complex dealings with the team, Coach K’s approach was to meet individually with each player and come to an understanding of how players should function within the team. In the one-on-one meetings Coach K clearly explained five points to each player. The first: We are going to communicate with each other and our teammates. We will not be communicating by text, email, twitter, or cell phone, but when we communicate, we are going to talk to each other, face-to-face, looking into each others’ eyes. Second: When we communicate with each other, we are going to tell the truth all of the time. Third: We are going to take responsibility for ourselves and all of our actions and hold ourselves and our teammates accountable for all we are required to do. Fourth: We are going to care for each other and cover each others’ backs. Fifth: we are going to take pride on all we do, and do the very best at all that we do. This is the approach of a real leader at person-to-person level with his team. It is fundamental and reaches the heart of the individual. The next step of the team building was to meet as a team and discuss such how the team will focus on the goal. Coach K asked the players who among them knew their school fight song. Naturally, some of the players had some idea of their fight songs either from high school or college, but questioning looks were prevalent. So Coach K asked, “OK, what is our fight song?” After some discussion, it was decided that the Star Bangled Banner( a Marvin Gaye version of one of the lesser known verses was chosen to be the team fight song) should be the fight song of the US Olympic Basketball Team. This upbeat song was played during practices and whenever the team was focusing on an upcoming game and it served as inspiration for all the players. The “icing on the cake” to bind the team together and focus the players’ hearts and minds was an activity at Arlington National Cemetery coordinated by Coach K and the Chairman of the Joint Chiefs of Staff, Army General Martin Dempsey. The activity included a day at the national cemetery, featuring a wreath-laying ceremony at the Tomb of the Unknown Soldier, exchanges of war experiences and basketball experiences between the 12 players and 12 military veterans of the wars in Iraq and Afghanistan. The culmination of the emotional and inspirational day was a simple ceremony involving the basketball players and the soldiers, sailors, marines and airmen. The 2 groups lined up facing each other – one player facing one military member. The military members wear an American flag on the right shoulder of their uniforms fastened by Velcro. As the final act of binding the US Olympic team together and focusing them on the reason for which they are playing, was for each soldier to remove the flag from the right shoulder and present it to the player opposite him/her. WOW!! How can anyone not give their very best following that amazing display of why and for whom the team is playing in the Olympics? In Coach K’s own words, everyone was crying like babies with the emotion of the monment. Naturally, the team went on to win the Olympic Gold Medal and hear the refrain of the team’s fight song, the National Anthem, played immediately after the gold medals had been placed around the players’ necks. There are many lessons to be learned from this story, but the most important lesson I took from it is that even at the highest levels of a profession involving the most accomplished participants and leaders in their field, the teamwork, commitment and inspiration is gained by an engaged leader reaching into the heart of each team member and inspiring him to achieve more than he could do by himself for the goal of the team…in this case, The USA. I will write about many other gems of wisdom and valuable lessons from this amazing presentation by Coach Mike Krzyzewski in later blog postings.